Usually, ants are considered a nuisance. We spray and scatter chemicals to rid us of their presence, occasionally resorting to even burning their nests to annihilate the colony. Nope, ants are usually absent from most folks’ “favorite animals” list. Poor ants – they are so misunderstood. A closer look at ants will reveal them to be very sophisticated creatures with a highly organized societal structure. Their colonies are architectural masterpieces. Think about that the next time you prepare to set a mound aflame or chemically eradicate it. Those loveable Scots Gordon and Fraser Lamont clearly appreciate the common ant, choosing them as the subject for Antics!, their entertaining and challenging game released in late 2010. Players each guide their ant family as they construct their mound and send forth the workers to retrieve enough food to insure the survival of the colony. It is a harsh world out there, though, as ants must avoid predators and the nasty solider ants of the other colonies. The most successful colony survives … for the time being. The large board depicts the world into which the ants will foray for food. There are several different types of terrain, all traversed by numerous paths leading to the various food sources. Each food source contains a limited amount of prey, forcing the ants to move quickly and efficiently. The art was done by one of the Lamont lasses, and while it works, it is cluttered and confusing. Above the board are placed fifteen ant hill tiles, five each in three different rows. I’ll explain these vital tiles in a bit. An anteater is placed at the end of each row. These anteaters will progress along the columns, eventually reaching the beginning, whereupon they will seek to devour their favorite foods: prey and ants. 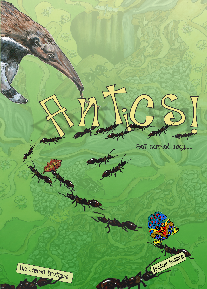 Players begin the game with a dozen ants, three action markers, an anthill base and ant hill tile, and one “magnificAnt”. Yes, as usual, the amusing Lamont brothers’ humor pervades the rule book. Each player executes three actions on their turn, placing their action pawns on the actions desired. The actions chosen must be available on their anthill. Thus, it is important to understand the anthill tiles and how the anthill is expanded. An anthill tile is comprised of two joined hexes, each side depicting a specific action. As players acquire these tiles, they must be added to their existing anthills. Placement rules are similar to those found in Marcel-Andre Casasola Merkle’s Taluva, from which this mechanism seems to have been borrowed. A tile must be placed adjacent to or on top of existing tiles, but cannot completely cover a previously placed tile. There can be no overhanging sections. There is an incentive to build an anthill vertically, as players may perform multiple actions the higher a tile is in their anthill. For me, this anthill construction is the most clever and fascinating aspect of the game. It is important to maintain a wide variety of actions, so care must be exercised when placing new tiles so as not to cover other needed actions. It is challenging to acquire desired tiles and optimally place them so you can pursue your strategy. Scout. The player can take one or more tiles from the display area. The number taken is dependent upon the level of the action. For example, if the tile upon which a player places his pawn is on the first level, he may take one tile from the first column of tiles. If the tile was on the third level, he can take three tiles, one each from columns one, two and three. Tiles are placed in reserve beside his existing anthill. A player may only possess three tiles in reserve, so it is important to integrate them into the anthill in a timely fashion. Build. The player adds one or more tiles to his anthill. These tiles are taken from the reserve, and the number that can be added is based on the level of the action being taken (as described above). I have already mentioned some of the placement restrictions. One further is that a tile cannot be placed on top of spaces containing action pawns or prey, and the maximum height of an anthill is five levels. As mentioned, it can be quite challenging to structure one’s actions and builds optimally. Hatch. Players hatch new ants, placing them in the six hatching areas depicted on the board. Of course, the number of ants hatched is based on the level of the action being taken. Players must place the first two ants in the same area, but are free to place the remaining ants wherever desired. The hatching areas correspond to the different types of terrain on the board. Ants. Players move ants from the hatching area onto the board, placing them in the matching terrain. All of a player’s ants must be part of unbroken chains of ants tracing back to the main anthill depicted on the board. Note that ants do not move once placed, so proper placement is important. Alternatively, a player may remove ants from the board with this action. Unlike reality, wherein there seems to be an unlimited quantity of ants, each player has a limited supply here. So, it is sometimes necessary to remove them from the board so they can be hatched and re-positioned. It is important to note that players can hatch and deploy soldier ants. They are used to safeguard a trail by protecting a player’s ant present in their space and/or steal prey or leaves from other ants, so long as they are not likewise protected. As soon as one player begins hatching soldier ants, it becomes a virtual arms race … or “ants” race, in this case. Heave. Heave as in “carry” as opposed to, well, the other type of heave. An ant can pick-up a leaf or prey from an adjacent clearing and move it along a chain of ants towards the central anthill. The number of heaves is based upon the level of the action taken. It is important to note that a player can only possess one of each type of prey. However, there isn’t enough of each type for each player, so there is a sense of urgency in obtaining the food. What about those leaves? Ants don’t eat leaves, do they? Not usually. Rather, leaves are used to cultivate fungus, so players will want to grab leaves for each fungus space in their anthills. Finally, a player may use his “magnificAnt” to perform any action of his choosing. It is a wild card, and comes in quite handy. After all players have taken their actions, the tiles and anteaters in the display slide to the left and new tiles are placed. If one or more anteaters reach the first column, they will search for food, eating prey and/or ants from the hatching areas. 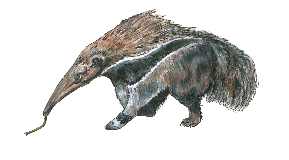 The anteaters search in a certain order, so players must be mindful of this when making their plans, especially when hatching new ants. Anteaters are not returned to the final column of the display until all three have reached the first column and fed. This process continues until there are not enough tiles to fill the display or there is only one (or no) prey remaining on the board. Each player gets one more turn and victory points are tallied. Points are scored for collected prey and fungi that have been seeded with leaves – the higher the level of the fungus, the more points scored. The player with the greatest number of points is named the Ant Queen and wins the game. The ultimate goal of the game is to send forth your ants to gather prey and leaves, safely hauling them back to the central anthill. Life as an ant is not easy, as players must keep a wary eye on the emergence of enemy soldier ants and the hungry anteaters. Further, food is scarce, so there is a race to gather needed prey and leaves to foster the growth of fungus. It is survival of the cleverest. As if these challenges were not enough, players must carefully construct their anthills and choose their actions wisely. Choosing the right tiles to add to one’s anthill is critical, as is their proper placement. It is easy to make a placement mistake and find yourself unable to perform desired actions. “Care” is the operative word. As mentioned, this is the most fascinating and challenging aspect of the game. While the rest of the game is good, this aspect truly shines. Drawbacks? A few. As mentioned, the board is muddled and confusing with unattractive artwork. The game also ends quicker than it should. Just when it seems you have constructed your anthill to a level wherein you can implement your plans, the game ends. It is rare when I wish a game would last longer, but in this case, a few more turns would help allow plans to bear fruit and make things more interesting. In spite of the drawbacks, the game is a good one. The theme is clever and relatively novel. There are no dragons, elves, medieval merchants, or castles and towers to build. That alone is refreshing. But it has much more going for it than the theme. It has many aspects for players to consider and manage, and many challenges to master. In my opinion, it is the best game yet from the affable Lamont Brothers. Mary Prasad: I agree with Greg on several points. Regarding the board art, it was very difficult to set up the first time – we couldn’t easily find the bugs (prey) and leaves that needed chits – we had to really look for them. The paths were hard to follow as well, especially with all the chits and ants on the board. I only played one time but the game did seem to end suddenly, just when I got my ant hill working well! The ant hill mechanism was the best part of the game for me. It was like a small puzzle, trying to figure out the best piece to place and where to put it. I loved the theme of the game and how well the game actually followed the theme. Joe Huber (1 play): I’ve always been curious to see what comes next from Fragor, but most of the games have fallen short for me. (The one notable exception is Snow Tails.) In general, their games have interesting themes, and often innovative mechanisms, but somehow the games fall short. Antics!, which I didn’t rush to play based upon past experiences, was no exception. The development of one’s anthill is really interesting, and IMHO is the heart of a good game – but the board play doesn’t come close to living up to that promise. That, IMHO, is why the game can feel “short” – players aren’t done with the interesting anthill development when the game is over. And thus – it feels to me like yet another game which could have used further development. Antics! should be my favorite Fragor game, but I just couldn’t convince myself that it was worth even a second play. Tom Rosen (5 plays): The Lamont brothers’ seventh published game is their best one yet and my second favorite game from 2010 (just behind Dominant Species). I was skeptical at first when the designers announced that the game would feature a brand new mechanism, but the ant-hill mechanism is in fact the fascinating and innovative heart of the game. While vaguely reminiscent of Java or Taluva, it takes the idea to a whole new level – excuse the pun – and really makes you think about how to arrange your tiles. The way in which each player’s ant hill develops differently has made this an intriguing game that has kept me coming back for more. The fixed map and the distracting artwork are a shame, but I’ve come to the conclusion that I can overlook these in favor of the game’s strengths. The only thing I still question is whether the end-game scoring system could be improved, but don’t think I have enough experience yet to say for sure. What I do know is that Antics provides a unique, engaging, and entertaining experience with a nice level of interactivity and excellent pacing. The game ends leaving you wanting just a bit more, an addictive trait indeed. This is one game that definitely needs a reprint! This entry was posted in Reviews and tagged Antics, Ants, Fragor, Fraser Lamont, Gordon Lamont, Lamont Brothers. Bookmark the permalink. Personally, I think the ‘natural’ looking board art fits the theme well and is generally well done. The pathways are not really that difficult to see. Yes, setup is a little bit difficult finding all the right spots, but there’s only so many places to look (i.e. at the intersections); its not really THAT hard, and you only have to do it once! As is typical of many games (including other Fragor games) timing is critical. If the game ended too quickly for you then you spent too long building the anthill and not enough time performing other actions – this game requires a balance of both. Yes, it’s easy to become focused/enamored by the anthill (especially in a first play), but there are other things happening on the board as well. You must act carefully when planning your routes, when to heave, and when to re-deploy to ensure you get a good distribution of prey and leaves. You have to consider if someone might deploy ‘guard’ ants that can steal what you’re heaving, or if they can come around the back way to get to leaves or prey that you waited too long to pick up. Now, having said all that, I do agree that perhaps there should be a bit more happening on the board – I’m not sure yet what it is but some little spark I can’t quite put my finger on. However, it’s only a nagging feeling and doesn’t prevent me from wanting to play this game more.